Today eBay rolled out their anonymous bidding policy. 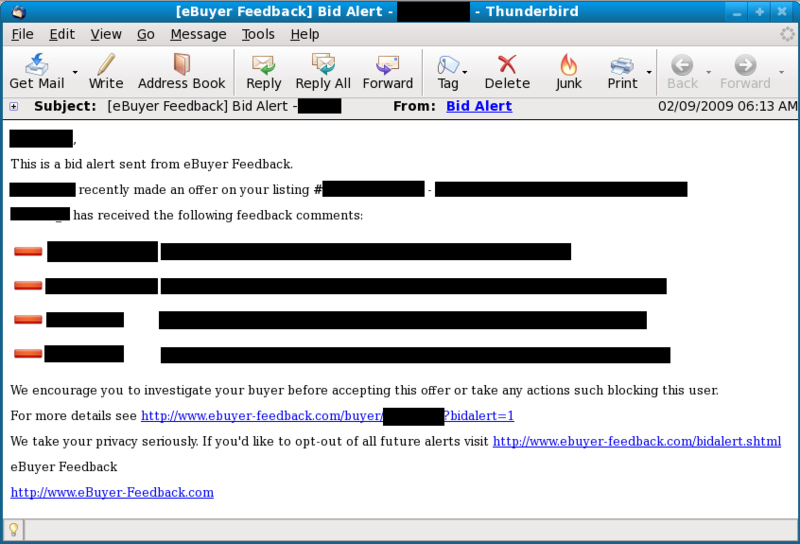 Earlier this year eBay anonymized all bidding activity before an auction ended but left the winning bidder publicly visible once the listing was over. Now even the winning bidder is left anonymous. Unfortunately this change renders our oldest feedback interface obsolete. This has resulted in a few changes to eBuyer Feedback. Sellers must now register with us before leaving feedback. Sellers must link their accounts through the eBay API. Sellers must use our easy to use, bulk feedback interface when leaving feedback. If you originally linked your account by sending ebuyerlink a message through eBay you must upgrade your account on the link account page. If you don’t then you will only be able to follow up or reply to feedback left about you. Fortunately these changes only affect a “small percentage” of our users. If you are unsure if this affects you visit the link account page. If you see the the word “Upgrade” then an upgrade will be necessary. Today we are publicly launching our bulk feedback feature. This is similar to bulk feedback using eBay’s Selling Manager. Currently we display if the transaction is marked as paid or shipped but in the future we’ll display feedback received as well. You can leave one comment for multiple positive transactions or leave negative and neutral feedback individually. You can even leave a default DBR score yet still rate some buyers individually. If your account has been approved you’ll see a new link in your link account page. You’ll need to log in and accept the terms for each account. You can then begin leaving feedback at the new bulk feedback page. If you are not currently approved and want this feature for your account contact us and we’ll review your eBay account activity. Don’t forget our feedback contest ends in almost two weeks. Each unique positive feedback comment left gives you one chance to win $150 and the seller leaving the most positive feedback comments will receive $250. Now you can have your eBay auctions displayed for free on this site. Simply login then go to the edit account page. Then check the appropriate box. Auctions and store listings from all your linked accounts will then begin appearing on this site. Since the feedback system hasn’t launched yet we will temporarily give everyone equal exposure. Now you can link your eBay account with your eBuyer Feedback account. Simply login then go to the linking page. Once you’ve entered your seller id follow the instructions to confirm. Currently there is only support for one eBay ID per account but you will be able to link multiple accounts in the future. Check back over the next few days when I add the ability to have your auctions advertised for free on this site. Today, eBuyer Feedback has officially launched to coincide with the eBay strike. The feedback system itself won’t go live until the day eBay makes their changes but users can now sign up. Less than 24 hours after launching we’ve already had almost 1000 hits, visitors from 47 of the 50 US states, many visitors from Europe and Australia, and 10 registered members. Over the next several weeks I’ll be adding more important features such as eBay account linking.